Worried about having your hip pocket picked? With Rogue, you can carry a specially-shaped wallet in your front trousers pocket instead. 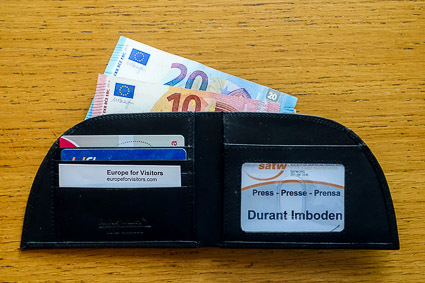 ABOVE: The International Traveler 8 version of the Rogue Front Pocket Wallet is designed to hold euros, dollars, and other currencies. Men, take note: Carrying a wallet in your hip pocket can make you vulnerable to pickpockets. Just as important, it may contribute to back, hip, and leg pain, as I learned when my doctor sent me to a physical therapist for treatment of sciatica. The obvious solution is to carry your wallet elsewhere on your body. If you choose the front pocket of your trousers, you might want to consider the Rogue Front Pocket Wallet, which is designed to fit snugly in the curved front or side pockets of men's pants. The Rogue Front Pocket Wallet looks a bit odd, but it works just like any other wallet: Depending on the version that you buy, it has pockets for credit cards, a clear pocket on the right side for your business card or ID, and one or two "stash pockets" behind the credit-card pockets. Most versions also have metallic "WalletGuard" shields sewn into the lining to protect against "RFID skimming" that can lead to identity or credit-card theft. During an extended field test of a sample provided by Rogue Industries, I used the International Traveler 8 model, which is slightly taller than most of the country's other models to accommodate banknotes of varying dimensions. It performed well, although--if I were making a purchase--I might be tempted to order the Rogue Front Pocket Wallet with Currency Divider, which has five separate compartments for storing banknotes. One caveat: If you sometimes carry your pocket in another location or item of clothing (such as a zippered shirt pocket, the zippered inside pocket of a vest, or an outside pocket on cargo pants), you may prefer a conventional rectangular wallet. But if you're in the habit of using your front trousers pocket as a money stash, the Rogue Front Pocket Wallet could be a perfect fit for you and your pants. For more information (including a list of retailers), or to order online, visit the Front Pocket Wallets page at Rogue-Industries.com.